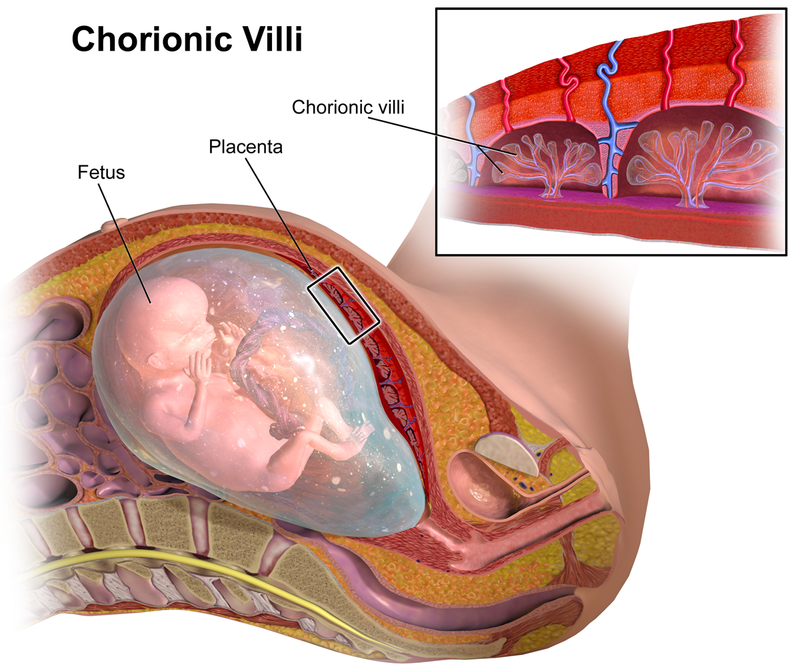 Chorionic villus sampling (CVS) is an invasive prenatal diagnostic procedure that is usually performed between 11 and 13+6 weeks of gestation. It involves the biopsy of the placental villi (chorionic villi), with the aim of diagnosing chromosomal abnormalities and autosomal dominant and recessive conditions. Common abnormalities can usually be diagnosed within 48 hours. The diagnostic accuracy of CVS is considered to be between 97.5% and 99.6% (slightly less than amniocentesis due to placental mosaicism). In this article, we shall look at the procedure, indications and complications of chorionic villus sampling. Fig 1 – The chorionic villi; these are the site of biopsy in CVS. CVS can be performed using either a transabdominal (most common method) or transcervical approach. The placental sample is obtained under local anaesthetic either by an ultrasound-guided transabdominal needle or by ultrasound-guided transcervical cannula aspiration or biopsy forceps. Tissue samples are then sent for chromosomal analysis. If the mother is RhD negative, Anti-D prophylaxis should be offered following the procedure. Ultrasound scan evidence of fetal abnormalities that are associated with a chromosomal or genetic condition. Miscarriage: There is an additional risk of 1% following chorionic villus sampling. This is considered to be slightly higher than amniocentesis, however the gestation in which CVS is performed is when spontaneous miscarriage is more common. Vaginal bleeding: occurs in around 1 in 10 women (higher in transcervical approach). There is also a 1% risk of a mosaic result (where both normal and abnormal cells are found). Amniocentesis may then be offered to establish whether the baby has a mosaic karyotype or if mosaicism is just confined to the placenta (confined placental mosaicism). The main alternative diagnostic test is amniocentesis. This is the most common invasive prenatal diagnostic procedure and involve sampling the amniotic fluid for karyotyping. This is typically performed from 15 weeks onwards. CVS has the advantage of being performed earlier in gestation than amniocentesis, allowing for investigation and management decisions to be made sooner.